Constructed from 4 x 2 RSC fully welded with front standing plate and ‘A’ frame drawbar. Single solid beam axle welded to chassis and fitted with 2 No. 4 stud unbraked hubs. 2 No 185x13x6 ply commercial van tyres fitted to 4 stud 5½ “pcd rims. 2” forged solid ring eye. Rear support stand, front sliding prop stand. Cylindrical in section with removable top section for tank access. Rear access door fitted with stainless steel hinge and fully lockable. Bund contains 110% to hinge line. Constructed from translucent heavy duty Polyethylene. 2” filler cap and chain. 1” vent valve, top mounted ½” BSP suction and return connections. Gate valve in base of tank, to pump. 1/2” pressure relief valve in tank top. K1 Semi-rotary hand pump c/w 15’ of 1” fuel hose, trigger nozzle and stowed on bracket. In-line ‘Y’ strainer. Primer and two top coats, single British Standard colour. Bowser complies with current Enviromental Agency, E.E.C. 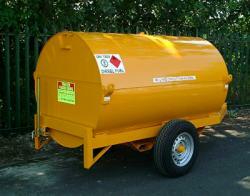 & Control of Pollution (Oil Storage) Regulations 2001 No 2954 for the carriage & storage of Fuel Oils.